Just a reminder that both Login and I will be off next week. All you have to do is read today's first item to know what I will be up to. That said, you can always get the latest breaking news at Axios.com. 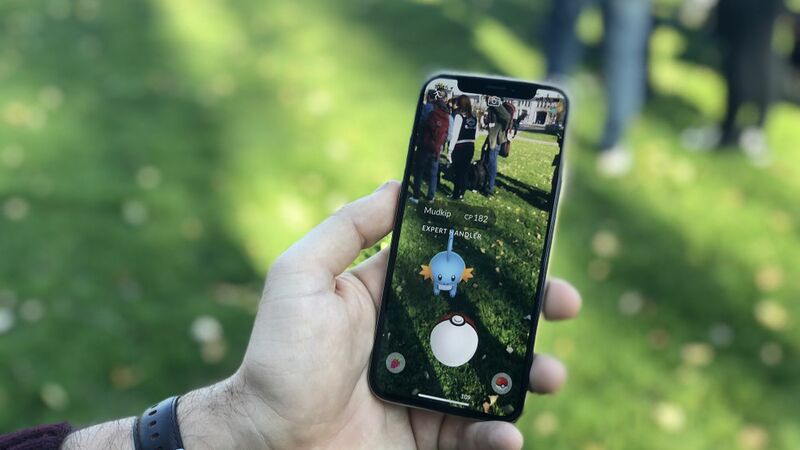 The creators of Pokémon Go are nearly ready to turn on an improved version of the augmented reality component of the game, drawing on the ARKit tools that Apple released with iOS 11. Enthusiasts have already spotted code in the latest update to the game and the new AR+ feature is expected to debut in the coming days. How it works: In the new setup, creatures are fixed to a position, getting bigger as users approach them and allowing people to view the creature from multiple angles. Also, the creatures can now flee if approached too quickly. Players who use the new AR feature, which requires a newer iPhone or iPad with iOS 11, can get "expert handler" bonuses for catching creatures in the new AR mode. What's next: Niantic CEO John Hanke said AR will play a big role in the company's future, including in the company's upcoming Harry Potter game, "Maybe some company will make amazing AR glasses in the future," he said, speaking alongside Apple executive Greg Joswiak at the company's San Francisco headquarters. "I can't imagine who that will be." There's more, including a video of the new feature in action, in this post. Tech has been at odds with Republicans all year over issues like climate change and immigration. But the industry will notch a victory with the party's tax plan, Axios' David McCabe reports. Industry groups were declaring success ahead of the Senate's passage of the bill early Wednesday morning. In a letter to congressional leaders on Monday, the Information Technology Industry Council praised the package's lowering of the overall corporate tax rate and switch to a territorial tax system, among other changes. "Reforming this tax code is long overdue, and we appreciate the leadership that Congress and the Administration have shown in moving this important issue forward," TechNet president Linda Moore said in a statement on Tuesday afternoon. Our thought bubble: There's a fair amount the industry likes in this bill and it's a big reason why execs sat through meeting after meeting with Trump and his team even when the White House was at war with Silicon Valley. What's next? The House is expected to re-vote on the package (thanks to some procedural speed bumps) before sending it to the White House for President Trump's signature. Linux vendor Red Hat beat sales and earnings estimates and issued a better-than-expected outlook, but shares nonetheless fell around 4% in after-hours trading. Between the lines: Asked about the drop, CEO James Whitehurst told Axios that perhaps some analysts wanted to see new bookings increase even more than they did. "While it was a solid beat, it wasn't a huge, huge, huge blowout," he said. However, he said that the company is optimistic it can keep its Linux business growing at mid-teens, while its emerging businesses can continue growing at more than 40% even as they become a larger portion of overall sales. Hopeful on tax cuts: Like others in tech, Whitehurst is hopeful that corporate tax cuts will spark companies to spend more on IT. "I am hopeful it is going to be good for our business," he said, noting that these days companies capital spending often goes to technology. But, he stressed he's no economist. "That's a CEO guesstimating what will happen." Telecom opportunity: While most analysts focus on the company's business selling to large corporations, Whitehurst said not everyone fully appreciates just how large the specific opportunity is in selling gear to major telecom companies that are shifting from proprietary servers to open systems as they move to 5G. "People see the open stack as an important part of the future of how these networks are going to be built," he said. Republican Rep. Marsha Blackburn announced legislation Tuesday that bans internet providers from blocking or slowing down the delivery of content. It also looks to block states from making their own net neutrality rules. But, but, but: It does not stop providers from establishing fast lanes that would give priority to some types web traffic or content over others. The other side: The Internet Association, which represents Google, Facebook and other tech companies, said that the "proposal circulated today does not meet the criteria for basic net neutrality protections – including bright-line rules and a ban on paid prioritization – and will not provide consumers the protections they need to have guaranteed access to the entire internet." Public Knowledge, a public interest group, said in a statement that the bill would also "remove almost all other FCC consumer protection authority over broadband networks." The bigger picture: This bill isn't likely going to attract much support from Democrats, who are starting to warm to the idea of trying to undo the FCC's net neutrality repeal. That effort, however, would need Republican support. Other bills on the issue are said to be in the works. On Wednesday, the European Union's highest court ruled that Uber is a transportation service and not a technology company, in line with a court advisor's recommendation in May, Axios' Kia Kokalitcheva reports. The ruling stems from a lawsuit filed by a Spanish taxi association. What it means: The EU's member countries can now regulate Uber as a transportation company (more strictly than as a tech service), though many already do so. Magic Leap finally showed what its hardware looks like and said the first version of the augmented reality headset will ship next year, though it did not announce pricing. It consists of a headset with multiple cameras and a small hip-worn computer pack. Why it matters: Magic Leap has been the most talked about AR product for years. Next year we will find out how well the hype lines up with reality. Axios' Steve LeVine asked a bunch of the industry's top AI experts for their pick on the biggest story of the year. Its list includes Landing.ai CEO Andrew Ng and Partnership for AI director Terah Lyons. The R Street Institute has added Charles Duan, formerly the director of Public Knowledge's Patent Reform Project, as a senior fellow to its tech and innovation policy team. Also joining as a senior fellow is Paul Rosenzweig, most recently a visiting fellow at the Heritage Foundation, who will help with cybersecurity and internet policy issues. Axios' Mike Allen talks about evolving transportation technology with Trump's National Economic Council Director Gary Cohn, along with other economic topics. Microsoft quickly pulled from its Windows Store a Google Chrome app that was merely a link to download the full browser from the internet, telling The Verge that approach violated its policies. Even Twitter's executives struggled to understand the company's verification criteria, according to BuzzFeed, as evidenced by internal emails over the debate on how to handle the account of Milo Yiannopoulos. Uber's Indian rival, Ola, is buying a food delivery service. While blaming North Korea for the WannaCry attack in May, Reuters reports the Trump administration is crediting Microsoft and Facebook for helping to thwart more attacks last week. 3D printer maker Carbon is announcing that GE and the venture arm of Adidas are among the investors in a planned $200 million funding round. Teenagers are getting politically engaged and voicing their opinions on the net neutrality repeal, NYT reports. Apple may enable iOS apps to run on Macs starting next year, Bloomberg reports. Here's what happens if you call the cell phone number Elon Musk accidentally posted Tuesday on Twitter.